Kingdom of Ruins Review and Giveaway! In the Lands Within, history does not rest. Each archaeological layer communicates with the living generation, choosing its friends and enemies—and its kings. But an alliance has been struck no one could have anticipated, and an ancient evil is soaking into the soil. History is being erased, purchased and re-written at a terrible price. And a kingdom that shouldn’t have been forgotten is fading from memory. My review: This story drew me in from the very beginning, with it's interesting heroine and then her journey through a wormhole to the Lands Within. The author does a fabulous job of bringing the characters to life in a highly imaginative fantasy world. I enjoyed this book tremendously and look forward to reading more by D.C.! The story hints to more coming, so I look forward to reading the next book that comes out. I received this book from Celebrate Lit. This is my honest review and was in no way swayed by receiving a complimentary copy. D.C. Marino is a dedicated reader of history books and fantasy novels, both of which occupy an equal amount of space on her bookshelves. But it wasn’t until she realized how one breathed life into the other that she became addicted to finding the intersections of the real world and the fairy story. Still more: what those intersections about us as a creative, curious people. Kingdom of Ruins is her debut novel. I’m so excited to share Kingdom of Ruins with you! This story has been on my heart and mind for over ten years now, so this feels a bit surreal. I’d love to tell you a bit about why I wrote this book. But in order to do that, I need to tell you why I almost didn’t. Fantasy. It isn’t real. Why should I spend time writing a story that doesn’t grapple with the actual issues of the day? Why not speak plainly, instead of inventing another world to explore the real one? These were the questions I asked myself every night before I fell asleep. I adored fiction that transported me to factual events, or introduced me to historical figures, but every time I picked up a pen, the fantastical wiggled out of it. I was afraid I was writing the wrong story. This story oddly (or not so oddly) enough began with Lori, an atephobic archaeologist. Meaning she had a passion for archaeology, but a phobic fear of ruins. Why would she shrink back from the work she loved? Because no matter how hard she tried, she couldn’t make whole the broken. Life ends in dust, and that’s all there is to it. I felt the same way. Not only was I writing something I wasn’t sure would be relevant, but could it mend anything? Make a difference? Or was it futile, like trying to resurrect the past? I wrote the right story. I hope you enjoy every bit of the journey as I did, dear reader. Up for grabs is a $50 gift card to Amazon! Be sure to leave a comment to grab extra entries. You have to go to the giveaway here to enter. A Christian Historical Romance Novel. Adrien Lockman is through with the political unrest and bloodshed in his home country of France, so he sets off to the Canadian territory's mountain frontier, in search of a place where a man can live his own life in peace. The last thing he expects to find is a woman, half-starved and half-frozen in a shack nestled among the towering peaks of the great Rocky Mountains. Mary Standish thought she'd finally found a place where she was accepted, trapping with her husband for the Hudson Bay Company. But when he dies after a gruesome grizzly fight, she determines to carry on their work. After all, life in these remote mountains is better than enduring the scorn and snubs of "civilized" folk. When she's forced to face a winter harder than any she's endured yet, her stubbornness may just be the death of her. Until a stranger appears at her ramshackle door. Adrien had planned to explore the mountain country all winter before he settles down to build a farm in the spring, but he can't leave this woman to die in the elements. Even though she seems desperate for him to go. As Mary regains strength, she's torn between wanting to save her dignity, and craving the respect of this man who's slipped past her defenses. As the winter worsens, the truth becomes all too real-the only way they'll survive is together. I haven't read the previous books in the series, which wound up working out, since this one actually takes place before the other two, so I didn't miss out on a lot of the back story. I enjoyed getting to know the characters and the strong message of the gospel was wonderful. Misty does a fantastic job of bringing the story to life! I look forward to reading more by her. I received this book from Celebrate Lit. All thoughts are my honest opinion and were in no way influenced. This Freedom Journey is a novella in my Heart of the Mountains series, so I wanted the cover to be similar in layout and style to the other books in that series. The setting is winter in the Canadian Rockies, so I knew Mary (the heroine) had to be bundled warmly! Funny story: Mary is mentioned in the other two books, although they’re set later in her life. When I first described her in the other books, I imagined her with amber brown eyes. When I chose the final cover for This Freedom Journey, I had to go back and change the amber brown eyes in those other manuscripts to the riveting blue on the cover. Misty is giving away a Grand Prize! The winner will get a $50 gift card to Amazon. My thoughts: I very much enjoyed this book, perhaps even more so than the previous ones in the series, since not only did it introduce some lovely new characters to the story, it also catches the reader up on what has happened since the previous books played out. I thought that Elaine did a wonderful job with some difficult subjects and bringing some thought provoking things up. I'm trying not to give away much of the story, since I hope you will read it for yourself! While I have enjoyed reading the previous books, readers can pick this one up by itself and still enjoy the story. I received this book from Celebrate Lit in exchange for my honest review. Elaine is graciously giving away a giftcard to Amazon! Be sure to go here to enter! Auschwitz Lullaby brings to life the story of Helene Hannemann—a woman who sacrificed everything for family and fought furiously for the children she hoped to save. On an otherwise ordinary morning in 1943, Helene Hannemann is preparing her five children for the day when the German police arrive at her home. Helene’s worst fears come true when the police, under strict orders from the SS, demand that her children and husband, all of Romani heritage, be taken into custody. Though Helene is German and safe from the forces invading her home, she refuses to leave her family—sealing her fate in a way she never could have imagined. After a terrifying trek across the continent, Helene and her family arrive at Auschwitz and are thrown into the chaos of the camp. Her husband, Johann, is separated from them, but Helene remains fiercely protective of her children and those around her. When the powers-that-be discover that Helene is not only a German but also a trained nurse, she is forced into service at the camp hospital, which is overseen by the notorious Dr. Mengele himself. Helene is under no illusions in terms of Dr. Mengele’s intentions, but she agrees to cooperate when he asks her to organize a day care and school for the Romani children in the camp. Though physically and emotionally brutalized by the conditions at Auschwitz, Helene musters the strength to protect the children in her care at any cost. Through sheer force of will, Helene provides a haven for the children of Auschwitz—an act of kindness and selflessness so great that it illuminates the darkest night of human history. Based on a true story, Mario Escobar’s Auschwitz Lullaby demonstrates the power of sacrifice and the strength of human dignity—even when all hope seems lost. My thoughts: Mario does an incredible job of bringing this true story to life through a fictional journal of Helene's time in Auschwitz. This book touched my mothering heart with the hard decisions it posed. The translation was well done, since I could hardly tell that it wasn't originally written in my native tongue (something that can bother me about translated books, some of them are poorly done). This book is a hard one to read, since it is about a difficult time in history, but it is also well done and beautifully written. I received this book from Booklook. My review is my honest opinion of the book. 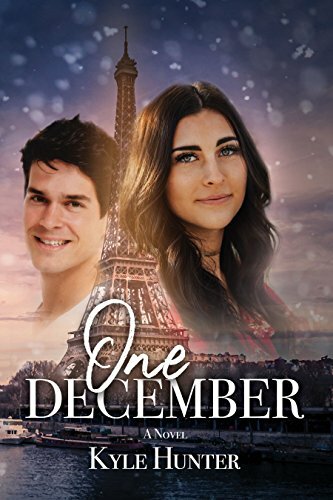 Welcome to the blog tour & giveaway for One December by Kyle Hunter, hosted by JustRead Publicity Tours! deaths might not have been an accident. sparks fly . . . but their mutual attraction takes an unexpected detour. If Mike and Nikki run away, how can they find each other again? My Review: I enjoyed Nikki and Mike's story tremendously! It explored some fun things, like a childhood crush that lasted through the years and living abroad. While I have always thought that living abroad would be a lot of fun, it was interesting to read about Nikki's move to France and put things in a slightly different perspective. This is an enjoyable book to pick up, I highly recommend it and look forward to reading more by Kyle! I received this book through Just Reads in exchange for my honest review. I didn't get into this series until I was an adult, when my husband had me watch one of the movies with him. I was hooked from there (of course, I had to go back and read the series that went along with the movie;)). When the local librarian mentioned that this series was all the rage with high schoolers, I thought it had something to do with eating disorders... I know, showing my ignorance here! I kept hearing how good Jody's medieval series was, but it took me a while to pick it up. This one is one of my favorites now! Several of my friends had told me how much they enjoyed Sarah's books, but it took me years to get around to reading them! They are every bit as enjoyable as I was told. What books are on your lists this week? What books should I have added to my list? Beau can’t press Adelaide too hard . . . he’s keeping secrets of his own. I love boxing. I love Hallmark movies. e boxes people have wanted to put me in. ~Robin Caroll is definitely a contradiction, but one that beckons you to get to know her better. southerner through and through. Her passion has always been to tell stories to entertain others. in the South, where else? Bookseller's Best, and Book of the Year. the giveaway and given 48 hours to respond or a new winner will be chosen. “Kids messing around in something they know nothing about. ”Addy turned onto St. Ann Street. Addy eased into Tracey’s driveway and turned off the headlights. Even by the dashboard light, Addy could see Tracey’s face had paled. But before Tracey answered, the hairs on the back of Addy’s neck rose to attention. Before the Tree of Life, everything in Abra Miller's life had been predictable. But after the Tree and the lightning and the angels, everything felt tenuous, like holding a soap bubble in the palm of her hand. She spent years looking for signs of that other world, waiting for it to break through. When it didn't, her friendship with Sam Chambers grew cold and distant, and they both wondered how any of it could actually have happened. Four years later, 16-year-old Abra's long-delayed quest to find the next manifestation of the Tree of Life is renewed when she sees a woman walking up the road--a woman who looks exactly like Sam's dead mother. The woman directs her to New Orleans where she will find the grave of Marie Laveau, one of seven gateways between this world and Over There. As Abra enters The Edge of Over There and begins her pursuit of the Tree once more, she doesn't know whom to fear or whom to trust. But she's starting to think that some doorways should never be opened. My thoughts: The writing on this story is solid and I found that there is a lot going on with it, but I had didn't care for some of the theology in the story line. Some of the elements of the story were almost to out there for me. I know that fans of Madeline L'Engle will appreciate this story though, since it is reminiscent of some of her books. I received this book from Revell in exchange for my honest review. Loving Grace review and Giveaway! iew tour plus giveaway, hosted by JustRead Publicity Tours! dreams and the boy almost next door. from the night of the accident. My review: I thoroughly enjoyed this adorable story about Grace! She is a sweet character to get to know, and I thought it was fun to learn more about the watermelon industry and also some of the work that goes into being a watermelon queen and promoting the industry. This is the perfect summer story to pick up, with it's sweet romance. I highly recommend this one! I received this book from Just Read tours in exchange for my honest review. s Degree in the Art of Teaching. items which complement the story. Find out more here. giveaway and given 48 hours to respond or a new winner will be chosen. A girl with a deadly lung disease . . .
A boy with a tragic past . . .
A land where the sun never sets but darkness still creeps in . . .
A bargain that brings life, but may cost more than anyone can imagine . . .
Madeline Oliver has never wanted for anything, but now she would give anything just to breathe. Jason Wu skates through life on jokes, but when a tragedy leaves him guilt-stricken, he promises to tell only the truth, no matter the price. When a mysterious stranger name Hanali appears to Madeline and offers to heal her in exchange for one year of service to his people, Madeline and Jason are swept into a strange land where they don’t know the rules and where their decisions carry consequences that reach farther than they could ever guess. My thoughts: This is the first book that I have read by Mikalatos, and I thoroughly enjoyed it! The characters are well written and come to live with their wit and struggles. I felt the pain that drove both characters to embark on their adventures. I felt like the underlying messages were encouraging and thought provoking, leaving the reader to think on the story after the final page is read. I look forward to reading the next book in the series! I only wish it were already out, so I could continue the story. Join the big trucks on the construction site! Little ones will love to explore these tactile pages—from rubbery tires to gritty dirt—and learn from the trucks how much fun it can be to work together. With touch-and-feel elements to increase sensory development and simple rhymes to boost vocabulary, Big Trucks will help your child discover something new with every read! My thoughts: This is a cute, colorful touch and feel book that both my kids are enjoying! The love the bright colors and the short descriptions of what each of the jobs is that needs to be done. They enjoy discovering the touch and feel parts of each picture as well. This is a fun book to read before bed for young children. I received this book from Booklook in exchange for my honest review. The Darkwater Inn stands tall and proud in the French Quarter, the hub of New Orleans. Bourbon Street is bustling, and general manager Adelaide Fountaine has her hands full with a hotel at capacity. But she is shocked when a body is found: a hotel guest stabbed with a kitchen knife. Detective Beau Savoie, Adelaide's childhood friend, is on the case. As Beau digs into the victim's past, he unearths a shocking connection between Adelaide and the murdered guest. Beau is hurt that his friend--the woman he's quietly loved for years--kept the truth from him. To make matters worse, the stress of the investigation has sent Adelaide right into the comforting arms of her coworker Dimitri. But Beau can't press Adelaide too hard . . . because he's keeping secrets of his own. Can Adelaide and Beau afford to hide from the truth with a killer on the loose? My thoughts: Another wonderful mystery by Robin Caroll! I thought that Darkwater Secrets was a fantastic start to this new series, and had a hard time putting it down! The book does show some of the seeder side of New Orleans, and has some triggers in it, but Robin does a wonderful job with writing about hard things and showing how healing it can be to open up about being victimized. This book has some interesting history about New Orleans, including the mysteriousness that surrounds the city. I look forward to seeing where the story goes in the next book! I received this book through JustRead tours in exchange for my honest review.